The live.grid object is a user interfaces object designed for use with the chucker~ object. 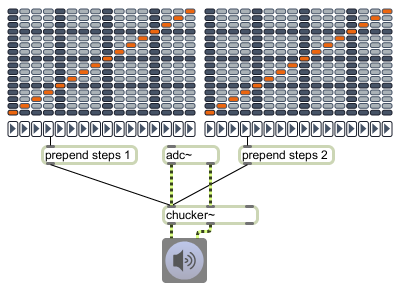 It provides a display grid of steps, constraints for transposition, and playback direction for use in controlling the chucker~ object. Sets, displays and outputs the current step. The list sent out the left outlet of the live.grid object takes the form step(s)direction (optional, depending on the visibility of the directions panel). When the live.grid object is in Matrix Mode and there is no value selected in the column, a 0 is sent as the step value. When the direction attribute is set to 0, a list of 2 values sets the step index and value. When the direction attribute is set to 1, a list of 3 values sets the step index, value and direction. When the matrixmode attribute is set to 1, a list of 3 values sets the object's behavior: x, y, and state (0/1). An optional fourth value can be used to set direction (-1/0/1). clear The clear message is only used when the matrixmode attribute is enabled, and will deselect all currently set rows and columns. Sets the constraint for a specific step. For instance, the message constraint 3 0 0 1 1 sets the constraints of the third step (column numbering starts at 1) to 0 0 1 1.
down Decreases (lowers) the current values of all the steps by one. New step values are sent out the second outlet. Note: The current constraints, if any, are also taken into account when altering current step values; the resulting shift might be "rounded" to the closest step. Set the index is 0 to hide the overlay used to indicate frozen values.Any index greater than zero sets and displays the frozen step. The word cell, followed by a pair of numbers that specifies the x and y indices of a cell in the live.grid display, will send a list consisting of the word cell, a number pair that specifies the x and y indices, and the value of the cell (column numbering starts at 1). The word getcolumn, followed by a number that specifies a column in the live.grid display, will send a list consisting of the word column, a number that specifies the column index, and a list of the current column values out the fourth (dumpout) outlet (column numbering starts at 1). The word getrow, followed by a number that specifies a row in the live.grid display, will send a list consisting of the word row, a number that specifies the row index, and a list of the current row values out the fourth (dumpout) outlet (row numbering starts at 1). init Restores and outputs the initial values. left Rotate the values of all steps to the left. New steps values are sent out the second outlet. linkdump When the link attribute is set to 1, the linkdump message sends all messages required to synchronize one live.grid object to another live.grid object out the object's right outlet. (mouse) Click and drag to edit the step values or constraints, depending on the current display mode. Sets and displays the current output step without causing output. directions: Randomize directions if the direction attribute is set to 1.
directions: Set all the directions to forward if the direction attribute is set to 1. The word setcell, followed by a pair of numbers that specifies the x and y indices of a cell in the live.grid display and a number value, will set the value of the specified cell (column numbering starts at 1). Sets the values of all the steps at once. Value numbering starts at 1.
right Rotate the values of all the steps to the right. New steps values are sent out the second outlet. up Increases (raises) the values of all steps. New steps values are sent out the second outlet. bgstepcolor float Sets the background step color of the live.grid object in RGBA format. bgstepcolor2 float Sets the second background step color of the live.grid object in RGBA format. bordercolor float Sets the border color of the live.grid object in RGBA format. bordercolor2 float Sets the second border color of the live.grid object in RGBA format. def. :1 Toggles the display of the directions arrows. directioncolor float Sets the color of the direction's arrows in RGBA format. freezecolor float Sets the color of all frozen steps in RGBA format. hbgcolor float Sets the highlighted background color of the live.grid object in RGBA format. def. :0 Toggles link mode. When activated, all the necessary messages to synchronize two live.grid objects are sent out the right outlet. def. :4 Defines the "first beat" indicator on the live.grid object's horizontal axis. The bgstepcolor attribute sets the display color for this indicator. To hide the indicator, set the attribute value to zero. def. :4 Defines the "first beat" indicator on the live.grid object's vertical axis. The bgstepcolor attribute sets the display color for this indicator. To hide the indicator, set the attribute value to zero. def. :0 Toggles matrix mode for the object's display. In matrix mode, multiple cells in a row or column may be selected. Note: The list and steps messages change their syntax slightly when used in conjunction with this attribute. See the listing for these messages for more details. def.:4. Defines the roundness of the grid in pixels. def. :16 Sets the number of rows in the live.grid object's display. The minimum number of rows is 2 when the matrixmode attribute is not set, and 1 if it is. def.:1. Defines the grid spacing in pixels. stepcolor float Sets the step color of the live.grid object in RGBA format. Out the fifth outlet: dumpout message used to query the live.grid object. Out the rightmost outlet: Synchronization messages are sent through this outlet when the link attribute is set to 1. Out the leftmost outlet: Current step value: y value, direction (optional, depending on the visibility of the directions pane). Out second outlet: The steps values are sent out this outlet whenever they are changed via the mouse or a message. If the live.grid object is in Matrix Mode, the step value/y value coordinates of all "on" points are sent out the outlet. Out third outlet: The directions values are sent out this outlet whenever they are changed via the mouse or a message. Note that this outlet does not output anything when the direction attribute is set to 0. Out the fourth outlet: Mouseover information: x, y, direction (optional, depending on the visibility of the directions panel). Also when the mouse is used to change a setting, the message mousechange N is sent, where N indicates the type of change (0 = steps, 1 = directions, 2 = constraints).